Home > Debt Articles > Budget Stuff > DebtGoal is Way Too Expensive to Justify. Walk on By. A press release about this company DebtGoal crossed my desk today. DebtGoal is actually GoalSpring Financial, Inc. Anyway here is the press release about this service that I think is way too expensive. “SAN FRANCISCO, March 25 /PRNewswire/ — DebtGoal (www.debtgoal.com), the leader in online do-it-yourself debt management, today announced the appointment of two personal finance experts to the company’s management team. Ed Ojdana, founder of FreeCreditReport.com, has joined DebtGoal’s Board of Directors, and Igor Vaks, former CIO of Experian Consumer Direct, has joined as the company’s Chief Operating Officer. 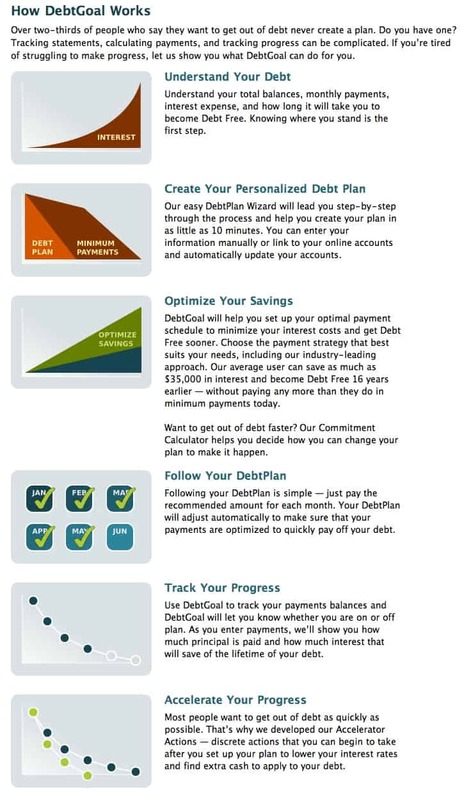 Ojdana and Vaks’ financial experience will be incredibly valuable as DebtGoal creates the new category of do-it-yourself debt reduction programs. Mr. Ojdana is widely known as the “godfather” of the online credit monitoring industry. After founding FreeCreditReport.com (under the name ConsumerInfo) and selling the company to Experian in 2002, Ojdana became the CEO of Experian Interactive, which operates other well-known online financial services such as LowerMyBills.com. He brings 15 years of experience in online financial services to DebtGoal. Mr. Vaks, former CIO of Experian Consumer Direct and FreeCreditReport.com, has joined as DebtGoal’s new COO. Vaks has 10 years of experience scaling the technical and business operations of industry-leading online consumer financial services. So I went to the DebtGoal site and took a good look at how the program works. The program costs $14.95 a month. – Source. And at those rates this program will cost you about $180.00 a year. Let’s say it takes you five years to get out of debt using the program, your total cost will have been $900 in program fees. If you use a spreadsheet to track your progress, or how about a piece of paper and a pen, over the same five year period, by purchasing ZilchWorks to get out of debt you’ll save $860 in service fees that you can use towards your debt. And if you want to create a similar report for free, just use my free online calculators here. That way you get to keep the entire $900 in your pocket. My opinion is that DebtGoal is a service you don’t need to spend money on. Steve, thanks for taking a look at DebtGoal. I respect your cost / benefit approach to looking at our program. I’d like to take a moment and tell you why we think it’s a great value. At DebtGoal, we recognize that there are many options for creating a payment schedule. Yours is fine, as is DebtPayment Pro. And, as you note, ZilchWorks is another. We believe that these suffer from some major flaws that keep them from being as effective as they might be. First, they require manual data entry. Second, they don’t correct for behavioral “slips” to keep users on-plan. Third, the payment schedules they provide is (at best) and approximation for the payment amounts in future months, as it’s impossible to get all payment amounts correct in the future, especially if a borrower deviates from the plan by making a purchase or paying more. Finally, simple payment calculators don’t let a user track progress—they’re a one-time payment calculator that doesn’t allow the borrower to interact with the tool and get the positive feedback from seeing the progress they’re making. •	DebtGoal links to your online accounts to automatically update your plan as your information changes without the need for manual data entry. With simple calculators, the plan is outdated after the first month since the payment estimated payment amounts are just that—estimates. The user essentially has to re-do their plan afresh each month. •	Our proprietary algorithm corrects for behavioral slips to encourage the user to stay on plan. Since it’s rare for borrowers to be able to stick to a plan without some setback or slip, this correction is essential. •	DebtGoal provides positive encouragement with each action—as a user records payments, we show them how much of each payment goes to principal and how much this will save them in interest over their plan. Many people find this engagement and feedback essential to staying with a plan—it associates a positive reward with the work and sacrifice of getting out of debt. In interview with our users, we’ve found that many people spend from 5 to 10 hours per month managing their debt. If our automation eliminates the need to enter information manually, we easily save users several hours per month. Using the minimum wage of $7.25 as a conservative estimate the value of someone’s time, if our automation saves someone two hours per month, they’ve just broken even. However, we believe it’s overly-simplistic to focus only on the time savings. Feedback from our thousands of users indicates that because of the time and complexity of other solutions, they simply lose their motivation. When the program is easier and provides feedback on your progress, you’re much more likely to stick with your plan. Valuing this is difficult, but it stands to reason that a product that you stick with is a better value that a “free” static plan that you can’t engage with at all. We think of ourselves as Weight Watchers for debt. You can make the same arguments about Weight Watchers—why pay if I could do this for free? We believe that, like Weight Watchers, we make it more likely that someone is successful in their goal to reduce debt. Would most people think it’s worth $15 per month to finally be debt free? The feedback we get is a resounding “yes”. At DebtGoal, we’re proud of the program we’ve put together and gratified that our users are using our program to pay off $1B in debt.